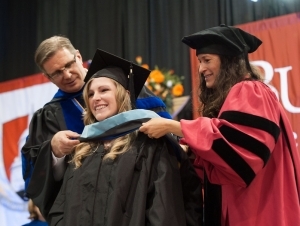 According to Kevin Railey, associate provost and dean of the Graduate School at Buffalo State, there are two ways to look at the benefits of graduate school. The first is personal: personal satisfaction, academic fulfillment, the intellectual satisfaction of learning. “However, people are also very interested in the pragmatic, financial benefits,” said Railey. The first reason to earn a graduate degree is to increase employment opportunities and promote career advancement. “Most of the research shows that people with a master’s degree earn more than people with a bachelor’s degree,” said Railey. “U.S. workers between the ages of 21 and 64 with a master's degree or higher earn an average annual salary of $55,242, versus those with a bachelor's degree whose average annual salary is $42,877, according to the United States Census Bureau.” Railey also said that unemployment for people with a bachelor’s degree is 4.5 percent; it’s lower—3.5 percent—for people with a master’s degree. A second reason to get a master’s degree is simply to keep up with workforce competition. The master’s degree is the fastest-growing degree, outpacing both the bachelor and doctoral degrees in growth. A third reason to get a master’s degree is that some careers, like teaching, require it. In many other careers, such as social work, it’s difficult to advance beyond entry level without a master’s degree. “Even in careers that don’t require it, a master’s degree indicates problem-solving skills, persistence, intellectual ability—the skills that help people earn promotions,” said Railey. Most of the master’s programs at Buffalo State involve experiential learning that relates to issues typically faced by employers. Students pursuing their master’s degrees often work closely with employers; in these arrangements, students get internship experience while providing expertise to employers. “Sometimes an employer brings a problem or need to our attention, and our graduate students tackle the project as part of earning their degrees,” said Railey. The Graduate School Information Session will be held Wednesday, March 11, from 4:30 p.m. to 6:00 p.m. in E.H. Butler Library 210. Register now.